By the guidance of Master Fard Muhammad, the Honorable Elijah Muhammad learned Minister Farrakhan’s identity. He knew, in a very profound way, the nature, the qualities and the future of Minister Farrakhan. He knew himself and he knew his Minister’s position or place in the plan of Allah, written in advance, in the scriptures. He gained Allah’s view of the future, which included the great work his Minister that he was divinely destined to do--for God and himself. In a very deep and specific manner, he came to see that Minister Farrakhan was made by God for him. He—the Honorable Elijah Muhammad— is alive. He is able to see and hear what is going on here in America and elsewhere. He is affecting it. He loves— with great intensity—his beloved people, for whom he sacrificed, suffered, studied and prayed over, and worked for over forty years to save. His determination and power, to save his people, with the help of the Divine Supreme Being, is greater than the collective determination and power of everyone who opposes his Minister; whose function (in part) is to serve as the last warner before the chastisement falls completely on America. He is not pleased by the evil thinking, planning and actions of those—whether they be Black, White or otherwise; especially against his Minister and the Believers. “Then I watched while he broke open the sixth seal, and there was a great earthquake; the sun turned as black as dark sackcloth and the whole moon became like blood. The stars in the sky fell to the earth like unripe figs shaken loose from the tree in a strong wind. “Then the sky was divided like a torn scroll curling up, and every mountain and island was moved from its place. The kings of the earth, the nobles, the military officers, the rich, the powerful, and every slave and free person hid themselves in caves and among mountain crags. What will bring on this kind of wrath mentioned in the passage quoted above? Certainly, Black people—others too—will be very angry if and when America moves to destroy the Honorable Minister Louis Farrakhan and the Nation of Islam. But in our present condition we don’t control the forces of nature and don’t know how to use them against the wicked. Minister Farrakhan demonstrates the wisdom of God (which witnesses to why the Honorable Elijah Muhammad placed him in his seat) in the magnificent way that he did. The roots of his success, which has been the case since he arose to rebuild the Nation of Islam, includes his doing as it is written of the righteous in the third chapter of Proverbs. He leans on the wisdom of God and is very mindful of Him. And Allah guides his heart, as is mentioned, in the Holy Quran, that He would do for the believers. 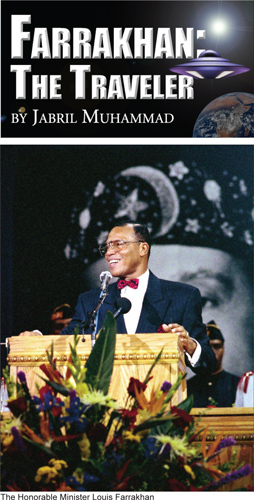 The Honorable Minister Louis Farrakhan is indeed an excellent example of how to follow the Honorable Elijah Muhammad. The 16th chapter of Matthew records an event, which, whether or not it actually happened two thousand years ago, in whole or in part, was written to give a picture of a specific set of events that took place prior to the departure of the Honorable Elijah Muhammad. This event of Matthew 16, foreshadowing certain events to come, has been referred to for nearly two thousand years as Peter’s confession. The essence of what is in Matthew 16 is that Jesus led his most intimate followers to a place called Caesarea Philippi. He deliberately chose a place that was outside of the locations where there was a greater Jewish influence. This city was a Gentile or pagan stronghold named after the Roman emperor Caesar. It was in Caesarea Philippi that Jesus chose to lead his followers, through a series of questions, to test their knowledge of his identity. He questioned them about who the people thought he was. Their answers showed their grasp of his place with God; his mission and position in the overall scheme of things. This was important, as he was, in effect, part of his own message. Could this have been fulfilled 2,000 years ago? No! Again, could this really have been fulfilled 2,000 years ago—especially in the light of the history of the world, from that time until now? There is the deepest kind of tie in between the meaning of the numbers of these verses in conjunction with their contents and the time of their fulfillment; especially in the work of the Honorable Minister Louis Farrakhan. Notice, Jesus is saying that he himself would direct this building work through Peter and others. He will do the building of his ‘church’ by the power of his God, after he had gone to where his Father was, and he would give Peter the keys to the kingdom at a time to come after the time when he was then talking to them. This building work of his began after he was put on the cross and after he went to his Father. At a certain point in his spiritual development the Honorable Minister Louis Farrakhan came to recognize certain truths about his teacher. With that came a sense of a future work that he would do in relation to that recognition. He informed his teacher of what he saw. This was one of the critical stages in his development. His teacher acknowledged what his Minister saw—up to a point—and continued his Minister’s preparation for that future work, which he has now been performing since 1977. It should be noted, here, that there was a specific set of exchanges—during this critical juncture (between the teacher and his pupil, from about 1968-1972) during which the latter wrote a letter to his teacher; in response to certain things his teacher was unfolding to him. I’ve seen a draft of that letter. I bear witness that it constitutes the fulfillment of ‘Peter’s Confession’. In fact the Honorable Elijah Muhammad had, over the years, made certain statements to Minister Farrakhan that led (guided) him to the recognition—to a certain extent—that his teacher was the Messiah/Christ, and that he had a special future work to do in connection with this recognition. According to the word-picture painted in the New Testament, the followers of Jesus came to see him much clearer after he departed and went to his Father (God). This word-picture is being fulfilled, in reality, even as you read these words. We are, for instance, living out, or fulfilling, the book of Acts, as well as other writings and histories. None of this is not to ignore specific truths the Honorable Elijah Muhammad said to this or that person, among his relatives, staff, followers and others. None of this is intended to ignore their value to the rise of Black people. However, this is to say that to the Honorable Elijah Muhammad, his Minister, the Honorable Minister Louis Farrakhan’s value was/is far beyond what is generally thought of him, even today. And this is to say that it is extremely dangerous to try to harm him. I am not overdoing this. More on how his value indicates the value of Black people to Allah next issue Allah willing.